If you’re an application developer, this is the MySQL book for you. That’s true whether you’ve never coded a SQL statement before or whether you’re coming to MySQL with a background in Oracle, SQL Server, or another flavor of SQL. It’s true whether you think that you know a lot about SQL, or whether you know that you know very little. It’s true whether you’re going to be your own database administrator (DBA) or whether a separate team handles that. See for yourself why this book has been the go-to MySQL resource for developers ever since the 1st Edition was published in 2012. I was amazed at how much information was packed into this book. The style of the book made it really easy to read and understand the information.... 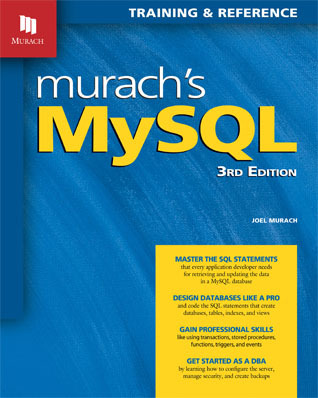 I learned a lot of new MySQL ideas reading this book, and I will be using it frequently as a reference." In this section, you’ll learn the concepts and terms for working with any database. You’ll learn how to use MySQL Workbench to work with a database and run SQL statements. And you’ll learn the basic SQL skills for retrieving data from a database and for adding, updating, and deleting data. When you complete this section, you’ll be able to continue with any of the other sections in the book. This section presents the advanced skills for retrieving data from a database. That includes working with classic features like summary queries, subqueries, data types, and functions, as well as with newer features like window functions and CTEs. These skills are sure to raise your expertise, even if you already have SQL experience. And you can read these chapters in whatever sequence you prefer. In this section, you’ll first learn how to design and normalize a database structure. With that background, you’ll see how to use MySQL Workbench to create and work with an EER (enhanced entity-relationship) model for your database. Then, you’ll learn how to implement the database design by using the DDL (Data Definition Language) statements that are a part of SQL. Finally, you’ll learn how to use views in a database to simplify data access and improve data security. When you’re done, you’ll be able to design and implement your own databases and views. And you’ll have a new perspective on databases that will make you a better SQL programmer, even if you never have to design a database. In this section, you’ll learn how to use MySQL to create stored procedures, functions, triggers, and events. In addition, you’ll learn how to manage transactions and locking. These features let you create stored programs made up of multiple SQL statements that can be stored in the database and accessed as needed, either to run on their own or to use in application programs…a great productivity booster! In this section, you’ll learn a starting set of skills for becoming a database administrator (DBA). These skills include how to secure a database by assigning privileges to users and roles, how to back up a database, and how to restore a database. I think it’s fair to say that most developers don’t know enough about SQL and the database management system they’re using. As one customer put it, "I know just enough about SQL to be a little bit dangerous!" That’s why developers often code SQL statements that don’t perform as efficiently as they ought to. That’s why they aren’t able to code some of the queries that they need for their applications. And that’s why they don’t take advantage of all the features that MySQL has to offer. That’s also why our MySQL book should be required reading for every application programmer who uses MySQL. It shows you how to code the SQL statements that you need for your applications. It shows you how to code these statements so they run efficiently. And it shows you how to take advantage of the most useful advanced features that MySQL has to offer. This book is also the right first book for anyone who wants to become a database administrator. Although this book doesn’t present all of the advanced skills that are needed by a DBA, it will get you started. Once you’ve finished it, you’ll be prepared for more advanced books on the subject. This book is also a good choice for anyone who wants to learn standard SQL. Since SQL is a standard language for accessing database data, most of the SQL code in this book will work with any database management system. As a result, once you use this book to learn how to use SQL to work with a MySQL database, you can transfer most of what you have learned to another DBMS such as Oracle, DB2, or Microsoft SQL Server. Although you will progress through this book more quickly if you have some development experience, everything you need to know about databases and SQL is presented in this book. As a result, you don’t need to have any programming background to use this book. We've updated all the content so it will work with MySQL 8.0 and beyond. We've added coverage of newer features that were introduced in MySQL 8.0, such as window funtions, Common Table Expressions (CTE), and roles for database security, so you can take advantage of them. We've improved and added explanations and coding examples as needed, to make the book a better-than-ever reference for you. Both of these products can be downloaded for free from MySQL’s website. And appendixes A (for Windows) and B (for macOS) provide complete instructions for installing them. MySQL is backwards compatible; in other words, new releases continue to implement most of the statements in earlier releases. That means that all of the SQL statements presented in this book should continue to work with future releases. It also means that most of the statements will work if you’re using an earlier release than MySQL 8.0, and we have done our best to identify any statements that won’t. If you use MySQL Workbench 8.0, all of the skills presented in this book should work exactly as described. However, MySQL Workbench is being actively developed, so its functionality is improving all the time. As a result, you may want to use a later release of MySQL Workbench. If you do, the skills presented in this book may not work exactly as described, but they’ll be similar enough that you shouldn’t have any trouble with them. "A very solid book with plenty of breadth and lots of examples. As a developer with almost 10 years of MySQL experience, I still picked up a lot of new detail on things I thought I knew." "I was amazed at how much information was packed into this book. The style of the book made it really easy to read and understand the information.... I learned a lot of new MySQL ideas reading this book, and I will be using it frequently as a reference." "If you ever want to learn to use MySQL, write SQL queries, create database elements, then this is the book to pick up. Rating: 10 Horseshoes." "I found this to be a great introductory book to MySQL.... The examples make it easy to quickly see the differences between the database system you have been working on and how to do the same thing in MySQL. Because of this book, I know that I could easily transition my skills in developing, managing, and designing an Oracle database application to a MySQL database system." "I love this book and refer back to it almost weekly." MySQL Workbench is a graphical user interface that makes it easy to work with MySQL database objects and to build and run SQL statements. This tutorial chapter shows you how to use it. This chapter shows you how to use SQL SELECT statements to retrieve data from a single table. Our hope is that this will give you a better idea of how much there is to learn about SQL querying...and how well our MySQL book works. The two appendixes at the end of the book – one for Windows and one for macOS – describe how to install and use these files.